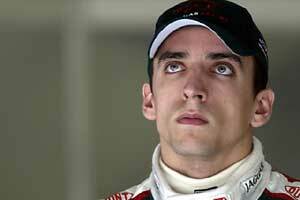 Justin Wilson followed a fairly normal career path in racing but when he ran out of money he took a risk and in 1998 he went to race in the Formula Palmer Audi series. He won the title and the prize was a Formula 3000 drive with the Astromega team. This led to a switch to Coca-Cola Nordic Racing in 2000 and in 2001 Wilson became the first British driver to win the FIA International Formula 3000 Championship. He tested for Jordan but his height proved to be a problem and he went into 2002 without a drive in Formula 1. Instead he raced in the Telefonica World Series where he showed well. In the middle of the year Minardi gave him a test, planning to put him in the car in place of Alex Yoong but he was too big for the chassis. At the end of the year however Minardi decided to build a slightly bigger car for 2003 and that meant that Wilson could drive for the team in 2003. Justin raised the money by floating himself on the London Stock Exchange did a good job against his Minardi team mate Jos Verstappen and in the midseason was hired by Jaguar Racing as a replacement for Antonio Pizzonia. He was dropped at the end of the year and went to America to race Champ Cars with the Mi-Jack Conquest Racing team in 2004. He moved on to RuSport in 2005 and won in Toronto. He was a frontrunner in 2006 and finished runner-up in the series to Sebastien Bourdais.